The idea of a summary is a short text to prepare students for the activities within the topic or week. The text is shown on the course page under the section name. 1. 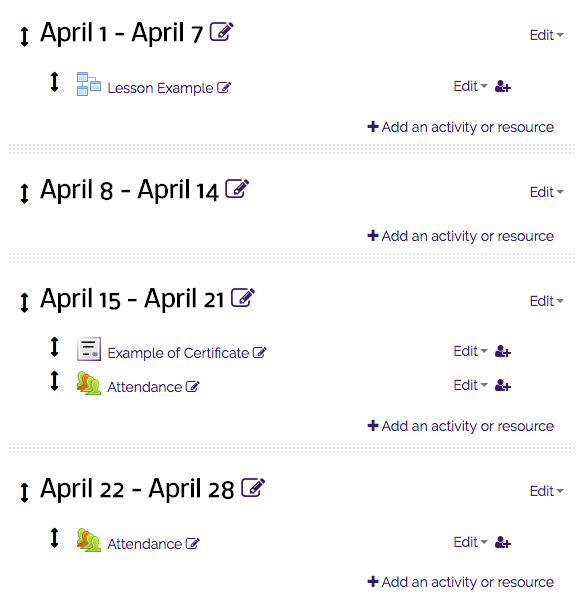 The middle area of the Moodle Course page is divided up into rectangles called Content Areas. 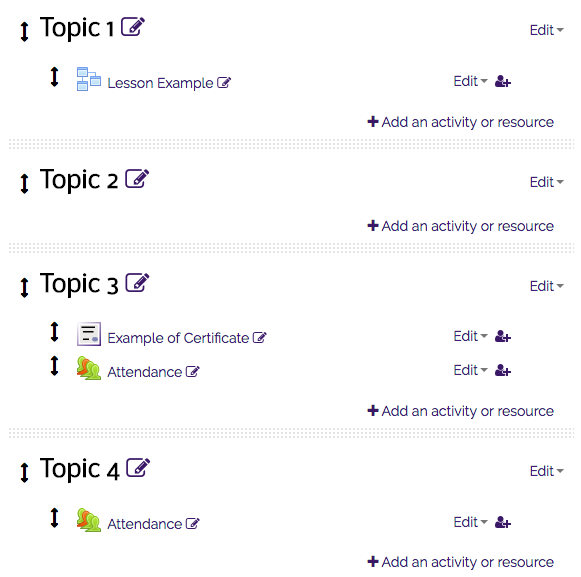 Links to the Activities and Resources in your course will be displayed within these Content Areas boxes. These content areas can represent either topics within your course or weeks within the semester. NOTE: To learn how to change the course format options (weekly format or topic format) see GROK article #18350 "Changing the Course Format." 2. Each content area has a Section Heading and Summary space, regardless of whether your format is set to Weekly or Topics. In the Weekly format, the Section Heading is set to automatically display dates corresponding to weeks in the semester. In the Topics format, the Section headings are numbered 1, 2, 3, etc. NOTE- If your course is set to Weekly format, or if you put Section Headings for your content areas in Topics format, links to your content areas will appear in the course outline in the Navigation block. Only content areas that contain content (text, images, activity links, or resource links) will be featured in the outline. Blank content areas will not be linked. If you display your course in Weekly format and have weeks containing no content, these weeks will not be linked from the course outline in the Navigation block. 1. Click the Edit button in the top right corner. 2. 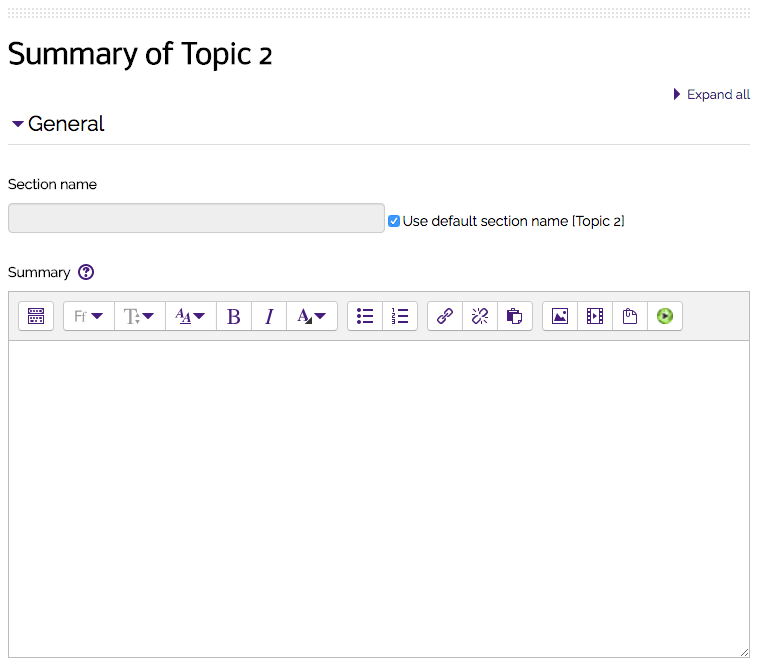 Click Edit then Edit Topic/Week option within a Content Area section at the top right. 3. Add your topic summary.